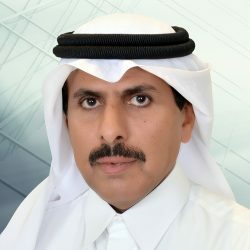 His Excellency Sheikh Abdulla Bin Saoud Al-Thani was appointed Governor of Qatar Central Bank in May 2006, having started his career in the Bank in 1981. He was Deputy Governor from 1990 to 2001 and subsequently left to serve as Chairman of the State Audit Bureau from 2001 to 2006, before assuming his current position. His Excellency was appointed as Chairman of the Board of Directors of the QFC Regulatory Authority in March 2012 and subsequently as Chairman of Qatar Financial Markets Authority later in 2012. His Excellency is also Chairman of Qatar’s Financial Stability & Risk Control Committee. He was appointed as the Chairman of the Islamic Financial Services Board (2013) as well as Chairman of the International Islamic Liquidity Management Corporation until December 2013 and is currently a member of both institutions. He also serves as the Chairman of the Board of Directors of Qatar Development Bank and is a member of the Board of Directors of the Supreme Council for Economic Affairs & Investment. He served as the Chairman of the Board of Directors of the Gulf Monetary Council for 2014. He is Board member at Qatar Investment Authority and the Chairman of the Governors of GCC Monetary Agencies and Central Banks Committee.